Deja in NO WAY forced me to make this petpage application. I did it because I wanted to. Best viewed in Firefox in 1366x768 resolution. Hi there! My name's Nikk. 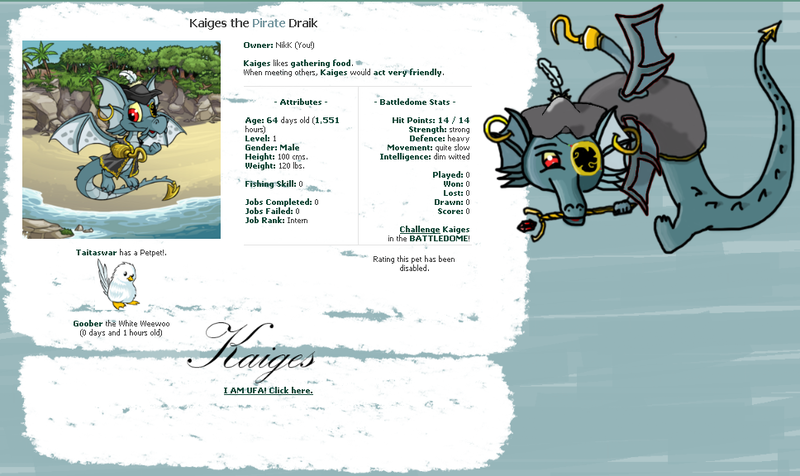 I'm applying to adopt Kaiges because Pirate Draiks have always been one of my dreamies, and as soon as I saw his name, I loved it. 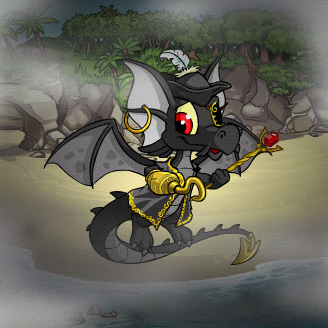 Well, actually my dreamie is a cross-painted Pirate-Shadow Draik, so if I get to adopt him I'll paint him Shadow. I'm a 16-year-old Argentinian guy who has been on and off Neo since 2006. Most of my info can be found on this page but I'm going to write a description here. I love being on the boards or in my guild board. I like collecting avvies. You can see my other dreamies here. In real life I like playing soccer, reading and listening to music. I'm currently zapping Taitaswar hoping for a dreamie. When I finish zapping Taitaswar I'll zap the pets on my other accounts. Personality: Tough, serious, wise, creative, sympathetic. Likes: Wandering around, flying, helping people out, traveling. Dislikes: Walking too much, waking up early, omelette, people telling him what to do. 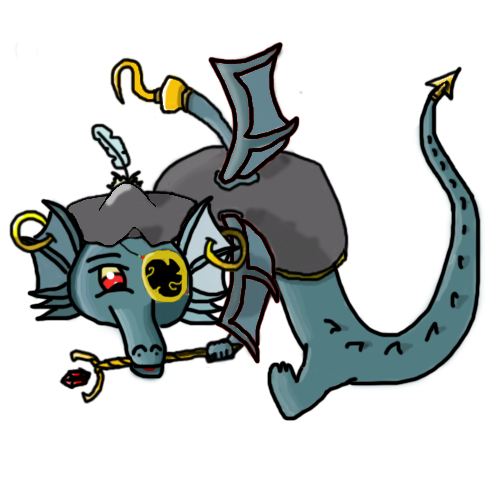 Kaiges, the Pirate Draik, was born on 18th March, 1989. When he was 6 years old, his parents got divorced so he lived with his mother. He only saw his father on weekends or special situations. He gave Kaiges a toy wand when he was a child, and he hasn't got rid of it since then. He still takes it with him wherever he goes, and he calls it 'The wand'. He considers it a lucky charm. His father worked in the Neopian Bank for 15 years, but after some time he stopped working there, and started working in the Food shop. Kaiges loved and admired him a lot. While Kaiges lived with his mother, she didn't treat him right. She hit him a lot and gave him just the necessary to live. She didn't have a job and didn't plan to. One day when he was 19, he found a White Weewoo stuck in a tree. Kaiges released him, and the Weewoo went away, flying happily. Two days later, the Weewoo was on Kaiges' -blocked- Since that day, the Weewoo has been with him. Kaiges named him Goober. Kaiges built Goober a little artificial tree on his Neolodge room for him to sleep there. Goober goes with Kaiges when he goes around Neopia, and they go flying together through all the lands. They have gone through a lot of adventures together, and Kaiges considers him his only friend. At age 16 Kaiges left. He felt sorry for leaving his father, but he had had enough. He didn't have a real home or any source of Neopoints income, so he slept at the Neolodge and stayed around the Money Tree, hoping to find money and be able to pay the Neolodge. Every day, after he has obtained enough money from the Money Tree, he goes flying around Neopia, discovering new things. Kaiges is a tough guy who isn't really happy all the time. He gets angry easily and hasn't got a lot of friends. It was hot, very hot. The sun reflected on Kaiges' skin, and the Lost Desert sand was unbelievably hot. Goober almost couldn't fly, and Kaiges sometimes had to stop to wait for him. Kaiges was sweating and he was really tired. Then he saw a Desert Hissi lying in the sand. Goober and him went to see what was going on. The Hissi was unconscious and full of sand, so Kaiges, not knowing what to do, took him —or her— to the city of Sakhmet, followed by Goober, and searched for a doctor. There were dozens of them, but all of them were too expensive. He found one generous Lutari who offered to treat him for free. The Lutari was tall, with brown fur, and kind of fat. He had a black hat and big brown boots. Kaiges thought it was weird that he offered to heal the Hissi for free, but he had to do something, so he accepted. The man took Kaiges, Goober and the Hissi to a nearby hut. It seemed small from outside. When they got in, Kaiges realised that it was bigger than it seemed. There was a bed next to the door, a chair on the corner, a stool next to the chair and a window on the other side of the place. The window provided enough light to see pretty well. Goober stood on Kaiges' arm. The Lutari placed the Hissi on the bed, grabbed the stool on the corner, put it next to the bed, sat there, and started examining the Hissi. What happened? The Lutari asked. I was flying around the Lost Desert and I found him laying on the sand, unconscious. Kaiges explained. So you don't know it? The man asked. No, I just found him Kaiges answered with a tired voice. Huh? Oh, no, no, sorry, I don't know if it's a male or a female. I'm just tired and... Kaiges was saying, when the Lutari interrupted him. Well, you were wrong The man said. He put a serious face. It's a she. Who are you anyways? Kaiges said, while the doctor kept examining the Hissi. And why are you treating her for free? That doesn't matter. She'll probably wake up in a bunch of hours. Three or four. She's fine. The man answered. Good. Do you know why she's unconscious? Kaiges was curious and worried. More worried than curious, though. There's no sign of any hits in the head or anything like that, and her face is red, so it must have been the heat. The man said, slowly. His face changed, now he seemed calm. Kaiges hadn't noticed she had a red face. She has a soft hit here in her arm but nothing to worry about. She'll have to stay here until she wakes up, though. There's a chair over there The man said, pointing at a chair in the corner of the room. Sit there if you want. Kaiges did what the Lutari said, and sat down. The chair creaked, scaring him. The Lutari chuckled. Kaiges noticed how much his legs ached when he sat down. He looked through the window, then at the Hissi. It was still very hot. He felt the heat in his skin. He looked at Goober. He was sleeping. He left his wand next to the chair, then he fell asleep. It was on the other side of the chair. He felt really stupid. Goober was still asleep. Oh! You woke up! There's good news: She's getting better. His face has a normal color now. The doctor said. Good. Kaiges asked. Sorry, how long have I been asleep? I don't know exactly. Must have been an hour or two. The doctor said. Thank you? Why? The doctor knew exactly why. For doing this. For helping her. Kaiges answered. The doctor smiled at him, then he continued examining the Hissi. A few moments passed, then Kaiges fell asleep again. Hey! You! Wake up! The Hissi woke up! Kaiges could hear a voice. The doctor's voice. Hey! Okay, good. Kaiges opened his eyes. The hissi wasn't in the room. Where is she? He asked worried, as if something had happened to her. Hey, calm down, she's in the bathroom. The doctor said calmly. Anyways, why do you care? You don't know her, but still seem very worried about her. I don't know, it's just... I don- He was interrupted by the flush of the toilet, followed by the Hissi opening the bathroom door. Oh, hi! Said the Hissi. Her voice seemed more... masculine than what Kaiges thought it'd be. Ehm.. Hi. Kaiges said. What's your name? He asked the Hissi. He was staring at her. I'm Ellie. Or at least I think so. Ellie seemed confused. Goober flew to her. Hi, little boy! Oh, he's so cute! She said, looking at Goober. What happened to you? The doctor asked. Eh... I.. I was flying over the Lost Desert, and suddenly I started feeling dizzy, and that's all I remember. She said, as she observed the hut. She still seemed confused. Thank you so much for saving me. She told Kaiges. Oh, yeah, no problem, I guess. Kaiges said. He didn't give much importance to it. I'm in debt with you. Ellie said. What's your name, by the way? I'm Kaiges He said. Then he glanced at the -blocked- He hadn't noticed it was dark already. Do you have a home? Kaiges asked Ellie. Ellie thought for a minute. She looked at the doctor, then at Kaiges. Yes. I live with my brother. Ehm... Milo. She said. No! Nilo. Yes. Nilo. She added. Okay then. I got to go now. It's getting late. Goob, come here. Kaiges said. Goober went flying and got on Kaiges' arm. He started walking rapidly towards the door. No, wait! There must be something I can do for you! Ellie shouted. Don't worry, I'm fine. Kaiges said. You can't leave just like that! Ellie really wanted to do something for him. Yes I can. There's nothing you can do for me. Kaiges left and started flying towards Neopia Central, with Goober on his back. Ellie followed him. Hey! Stop! You saved my life! There MUST be something I can do for you! She shouted. Kaiges stopped. He turned towards Ellie. Goober almost falls. Ellie stopped too. Listen, Ellie. I sleep at the Neolodge. I eat at the Neolodge. I fly all over Neopia. I really don't need anything. Kaiges said. Please, stop following me. I have everything I need. Yes, I saved your life. So what? I don't need anything in exchange. What do you mean 'So what?'? Saving someone's life isn't a big deal? Besides, there is something you need. You need a home. Ellie said very seriously. I don't need a home! I already have one! My home is the Neolodge! Kaiges shouted. He was getting angry. The Neolodge isn't a home, you know. It's a hotel. Come and sleep in my house. We have a spare room and I'm sure my brother won't mind. Ellie said. Ellie, understand. I don't need a home. I don't need to sleep in your house. He whimpered. Could you please stop following me? I swear I'm fine. You know what? Do what you want. Ellie shouted angrily, and left. Kaiges wasn't angry anymore. Now he was sad. Everything was dark, the air was tense, and it was very cold. Kaiges was shivering. He continued his trip to Neopia Central and went into the Neolodge. Goober flew to his little tree, and Kaiges went to his bed and tried to sleep. He couldn't. The air was very heavy. It was cold, but he was sweating. He kept thinking about Ellie. About how he found her, he took her to Sakhmet, saved her, and left her. There he was, on his dark Neolodge room, lying on his bed, thinking about Ellie. Personality: Happy, helpful, funny, friendly, persistent. Likes: Sleeping, making new friends, exploring, helping. Dislikes: People not doing what she wants, meat, sliding. Likes: Discovering medicines, eating, healing people. Dislikes: Heat, questions, large crowds. Likes: Playing with Kaiges, flying, resting. Dislikes: Being tired, Neolodge food, when people shout. If I get to adopt Kaiges, I'll paint him Shadow. If I got to adopt Kaiges, I'd keep him on my main and would (obviously) never pound him/trade him/lend him (for whatever reason)/put him in risk in whatever way. Why do I want to adopt Kaiges so much? 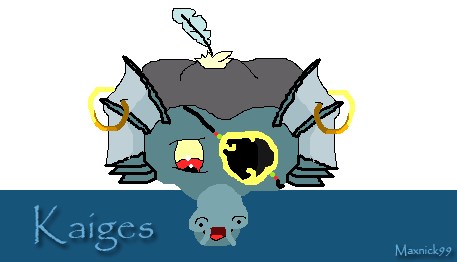 What makes Kaiges stand out from the other Pirate Draiks? When I was young, I loved, like, loooooved Draiks. I loved dragons and all that kind of stuff. I have loved them ever since, but I always thought I'd never get one. About a year and something ago, I decided I was going to get one. But first I had to decide everything: The gender, name, colour, clothing... When I had decided everything (Male, Buore, Shadow, Pirate clothing), I started saving NPs to buy a Draik Egg (I was broke since I had recently bought the SLM). After some time, I realised I was really bad at saving NPs (or making them). But I didn't give up. 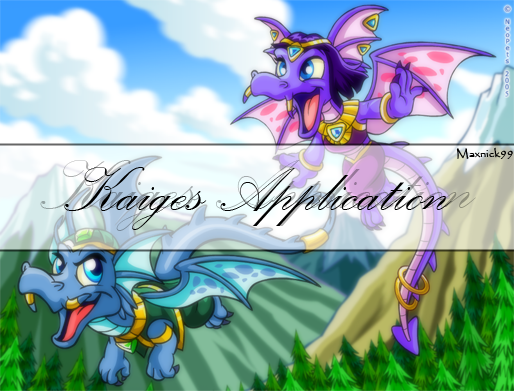 While I was still saving, little by little, I started searching the boards for Draiks UFA. It wouldn't be the name I had planned, but that didn't matter. It could even be a better one! There were more Draiks than what I had thought there were going to be, but none of them caught my attention. Some almost convinced me of making an app, but none did. Until I saw Kaiges. When I first saw he was UFA, I loved his name and a personality/story almost instantly popped in my mind. I had to adopt him. I needed to adopt him. So I started making an app for him, and here I am. I'm really bad at drawing, but I decided to try for this app. I was planning to use it as an hr (section divider), but it turned out to be too big for that, so I just put it here. No, he's not chewing his wand. If I do more art (or someone does art for me) I'll put it here too.